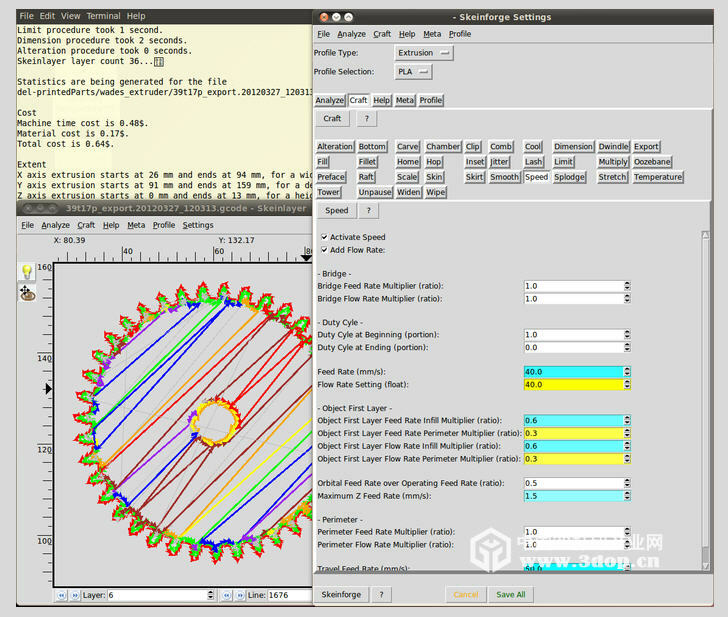 Skeinforge is a 3D slicing software used in MakerWare and ReplicatorG to convert STL or OBJ files for printing. In 3D printing, Skeinforge slices the 3D model into sections and determines how the layers will be printed. Once the files have been created, Skeinforge creates a G-code which is then converted to X3G or S3G and then is sent to the printer. Skeinforge requires Python and Tkinter to run. It accepts G-code, GTS, OBJ, STL, SVG, AND XML files. You can also edit your model in Skeinforge with Craft Plugins that have features such as alteration, carve, cool, dimension, and multiply. Alteration: This is where the start and end G-code files locations are specified. Layer Height: This allows you to choose the height of each layer. The smaller the layer, the smoother the product and the longer it takes to print. Cool: Cool allows you to control the cooling time before adding another layer. Choosing the minimum layer time will allow for faster printing. Dimension: Dimension controls when and how much filament goes through the extruder. This allows you to control how much plastic is being used on the model. Multiply: Multiply allows you to print two or more copies of the model. You can choose Number of Rows and Number of Columns and choose how far apart they are. Skeinforge has many other useful features that allow you to have full control over your printing process.